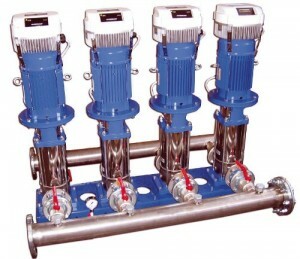 The Lowara GHV series booster sets are fully automatic booster sets for water supply. They are equipped with 2-4 variable speed pumps with a Hydrovar pump controller, pressure transmitters and control panel, all mounted on a frame for easy installation. The Hydrovar pump controller is easy to program, designed for maximum energy efficiency and can communicate with a BMS system via Modbus. Vertical multistage pumps e-SV series from 3 to 125.